A little too late… for dVerse Meeting the Bar, where Mr. Tony Maude commenced the game of Bouts-rimés. dang…this is awesome…its thunder in the desert man….it thumps and is intense and raw feeling….sewage was a great pick up….one of my favs of this challenge man….serious. This has to be one of my favorite poems I have read from you.. really great how your used those words and twisted them.. I can feel an little beat poetry into that sadness… I agree with Brian.. one of my favs if this was ever a competition. Great sense of language here–just a wow! You did the challenge proud – a true paso doble of emotion and intent! Excellent use of the words! Yes, your lines were excellent, and your interpretation of the words was very creative; liked the line /from marigolds paper from ashen face/l; excellent job, Anmol. “sewage” was a brilliant way to re-work “wage”. Wonderful imagery in this! Raw.. like that sewage.. a unique use of the wage prompt word. Emotional and true.. well done! Wow, this is fantastic. I felt every word of this piece. Terrific write! “sewage”!! who’d a thunk? (you, obviously) Really well done. And yes, chocolate rocks! This was well crafted and I like how you re-worked the words to create this poem..ain’t no pain like that.. There are two kinds of love poems and this is the other kind. I like how you set the poem up visually– makes it read better and very clearly when we’re at the bottom, we’re there. I really like the line “marigolds with ashen face” very clear, very real. We’ve all been there, if you feel at all…. A very visual write and great use of the word prompt. Clever! This is such a successful piece on many levels. The brutal metaphor, the interesting schema and your bold way with words all make it a delight to read. Very strong imagery. And it ends with a ‘gut punch’ —“There ain’t no pain like that.” Really stunning. beautiful colours here.. very strong emotions. Not having taken up the challenge from dVerse, I can’t speak to the use of their words, but standing alone this poem explodes itself into visual and painfully colored images that both appall and thrill. Oh that a gored person could be so poetic about his apathetic hunter! The whole flow & formatting of your piece leads to a powerful read. I especially like this part: it lingers in the air, her perfume made / from marigolds papered from ashen face, / that turned away from my sight, not to nurse / my wounds stained by steel, of her solemn church—these lines has an excellent feel to it. Smiles. Oh, this is just flawless. I didn’t realize till the end you were writing to the prompt because it flowed so well. Wow! Such vivid images. Very powerful. 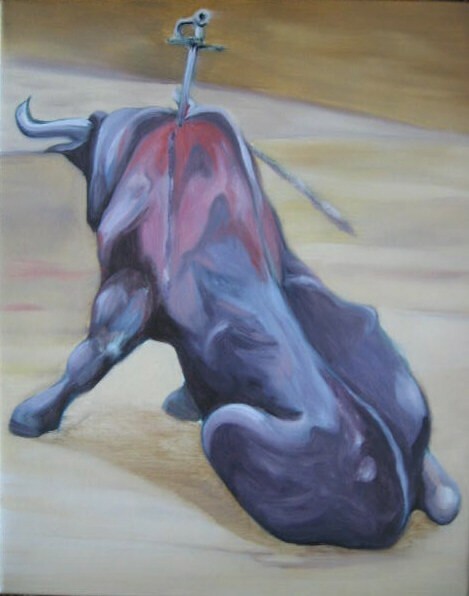 The image of the gored bull was riveting enough, and your poem expanded on that so strongly. You knocked it out of the park ! I see the form here as the extension of content: bleeding, ache, pain, and all in a poem that looks to me like a twisted spine.